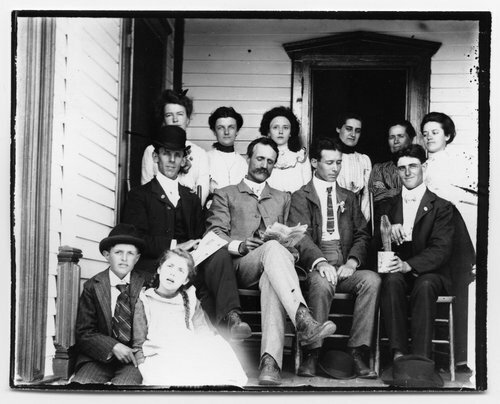 A photograph showing family and friends at Charles Harvey and Melissa Way's home in rural Canton, McPherson County, Kansas. People in the photograph are identified as: standing (l to r) Grace Powers, related to John Powers; Dottie Wheeler, McPherson College student; Irene A. Rena Martin, future wife of Charles Albertis "Bert" Way; Hannah Leota "Maggie" Way, daughter of Charles Harvey and Melissa Way; Melissa Paxson Way; Rena Maude Way, daughter of Charles Harvey and Melissa Way and the furture wife of Golden Charles "Golie" Dresher; seated (l to r) James Clement, McPherson College student; Charles Harvey "C. H." Way; John Powers, son of a neighbor; Charles Albertis "Bert", son of Charles Harvey and Melissa Way; and seated on the porch floor Purl Benjamin "P. B." Way and Lillie Lois Way, the two youngest children of Charles Harvey and Melissa Way.